Camping up in the Colorado mountains! It doesn't get better than powder doughnuts for breakfast. The chipmunks would come right up to their feet to beg for food but no one was sharing! So we've climbed to the top of this gorgeous vista and two of the boys are grouchy but I had to have the picture no matter what. They had a ton of fun camping though and they wished we went everyweekend. Their favorite activity was the fire and secret hiding spot under the Evergreen. Steve also put up a ropes course for them and it kept them occupied long enough for mom and dad to get a nap in so it was all worth it! I can't believe we don't do this every weekend. It was so fun to get away from the city. This picture is in the running for this years Christmas picture. We'll see how my luck goes in getting all of these poeple to sit still for another one. So Julia put this bucket on her head and walked around the house jabbering and singing. We were laughing our guts out. Our friend Mary took us to the Berry Patch Farm to pick our own strawberries. You pay by the pint but you can eat all you want while you're there. Julia and Cooper were fantastic pickers but they didn't make it out with much. After the strawberries we went on to the rasberries which were heaven! The farm is so darling. Their chickens and pig are just walking around freely. It was a great day . Cooling off in the sink after a hot day. She is quite the princess. 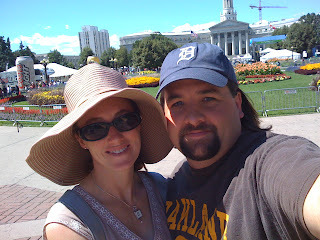 We left the kids with a baby sitter and went downtown to enjoy the Peoples' Fair and A taste of Colorado. I'm not sure why this beautiful woman keeps hanging around with me.